There's still a few weeks left until the official start of Spring/Spring equinox and Nowruz (Persian New Year). Iranians and many of the neighboring countries celebrate this ancient tradition and each year welcome the nature's rebirth and rejuvenation by starting the traditional khaneh tekani (spring cleaning). Khaneh tekani literally means to "shake the house" by cleaning every nook and cranny and getting the house in order from top to bottom! For instance, one can give the most overused room in the house where everybody hangs out a fresh coat of paint, clean the rugs and draperies and have the house all clean and organized in time for Persian New Year. Out with the old and in with the new! Food is also an important part of the Nowruz celebrations and the traditional menu may vary by regions and household to household. رشته پلو Reshteh polow is a delicious rice dish that can be enjoyed throughout the year, however it is known as a New Year specialty. Reshteh (noodles) also means string and eating reshteh polow, preferably on the eve of Eid-e Nowruz, helps sar-reshteh kar dastet biad which means to grab hold of your your life and destiny and to attain success in life. 3-4 ounces of reshteh (toasted noodles), cut into small sized pieces. Reshteh may be found in Persian/Iranian grocery stores. Wash the rice with cool water a few times. Soak in 8 cups of water, add 4 tablespoons of salt and set aside for a couple of hours. In a large non-stick pot bring 3 quarts of water to a rapid boil on high heat. Drain the soaked rice and gently pour into the pot. Bring the water back to a boil on high heat, add the toasted noodles and boil them together for about 7 minutes. Test to see if the rice is ready. Rice should be firm in the center and soft on the outside. The noodles should also be somewhat soft yet a little firm. 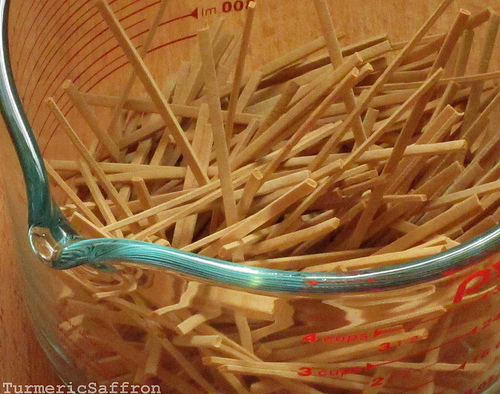 Then drain the rice and noodles in a fine mesh colander and rinse with cool water. 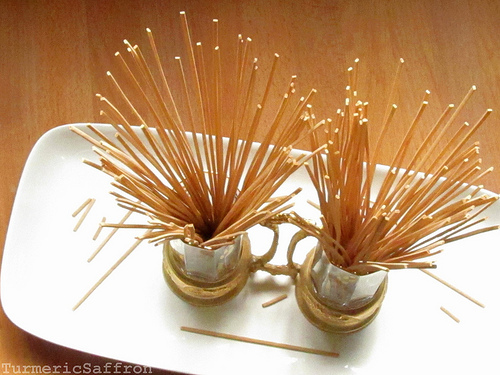 Wash the pot and return to heat, add 4 tablespoons oil or butter and 1-2 tablespoons of liquid saffron. With a large spatula place the rice into the pot, building it into a pyramid shape. In order to release the steam make 3-4 holes in the rice with the bottom of the spatula. Leave the uncovered pot on medium-high heat for about 7 minutes or until the steam starts to come out, pour 2 tablespoons oil and 1/4 cup of water over the rice, cover, steam the rice on low heat for another 45-50 minutes. 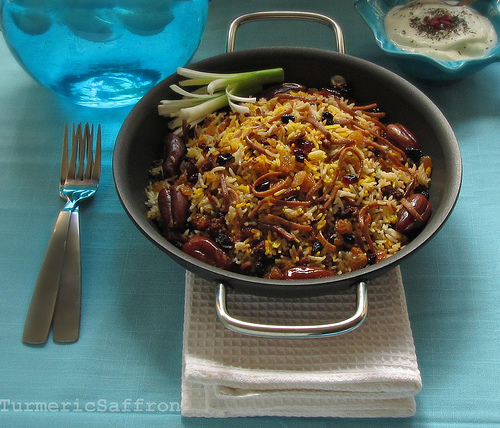 With a large scoop take some rice out of the pot and mix in with the dissolved saffron, set aside. 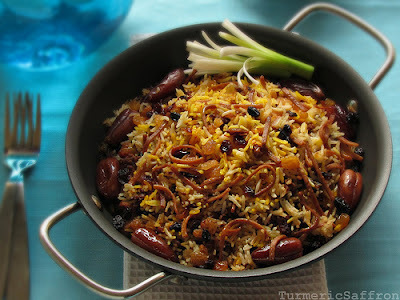 Serve reshteh polow on a platter, arrange the saffron rice on top and garnish with fried onions, raisins and dates. Reshteh polow is usually served with tender lamb shanks but if you prefer you can serve it with little meatballs or chicken. This stew is a perfect combination of fresh okra and tender eggplant simmering in a luscious tomato sauce along with browned lamb cubes. 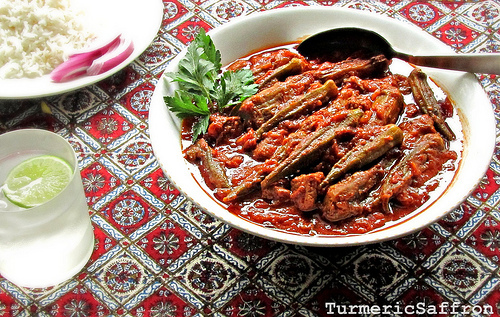 Even if you're not too crazy about okra this delicious khoresh would most likely change your mind. 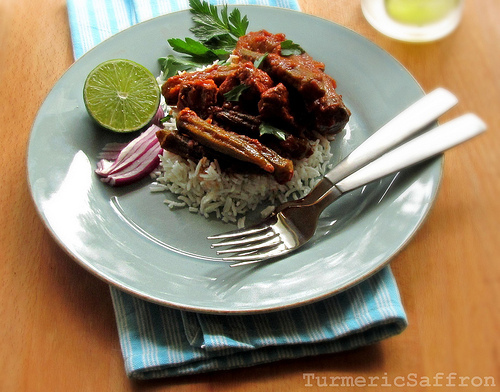 There's something magical about the combination of eggplant, okra, tomatoes and lime juice. 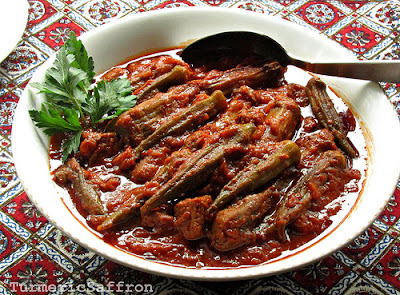 خورش بامیه و بادمجان Eggplant & Okra stew could also be made with غوره ghooreh (unripe grapes) if available where you live. The use of freshly squeezed lime juice, abghooreh (verjuice) or limoo amani (dried lemon) is key in Iranian cooking. The acidity of these ingredients definitely enhances the flavor of most dishes. 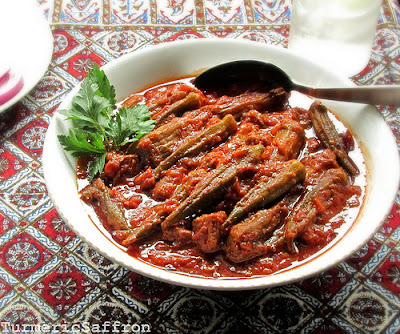 Eggplant is widely used in Persian cuisine, for instance some popular dishes include khoresh bademjan, borani bademjan, and kashke-bademjan . Whereas okra on the other hand, is mostly sauteed and cooked in khoresh bamieh, a popular southern dish. 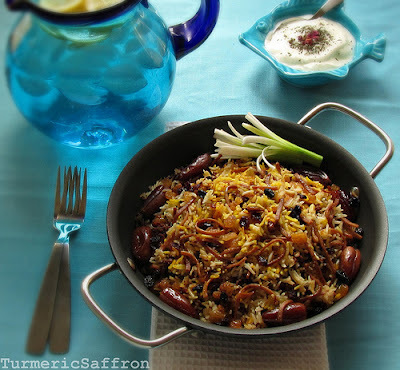 In our home my mother always made khoresh bamieh with tamarind sauce and the taste was so incredibly amazing that I haven't tried to change my mother's recipe and use any other sauce instead. However, since I'm adding eggplant to this dish I'll use a couple tablespoons of tomato paste and a large tomato as a base with the addition of lime juice. While preparing the ingredients remember not to cut into the okra and to gently trim the top, but leave the top cap and the bottom intact since this would prevent the stew from becoming slimy. Also, add the lime juice to the stew before adding the okra. 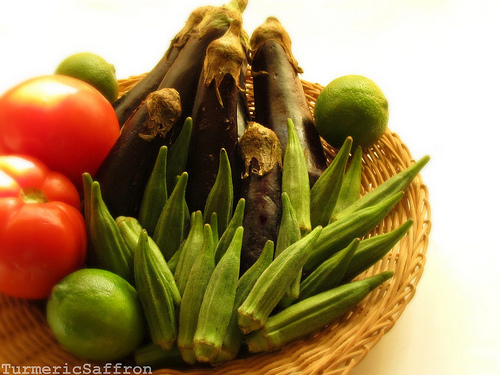 Place peeled eggplant in a colander, sprinkle with salt and let them drain for a couple of hours before cooking. Heat 1/2 a cup of vegetable oil in a large skillet over medium-high heat and fry the eggplants until golden brown. Remove and place fried eggplant on a paper towel. Add the lime juice to the stew, stir and gently place the fried eggplant and okra in the pot. Taste and adjust the seasoning with salt, pepper and lime juice. Add a little more water if necessary. Cover and simmer for another 30-40 minutes on low heat. To serve, gently spoon the stew in a large serving bowl. Serve hot with rice, salad shirazi and mast o khiar.